It’s Monkey Day today! 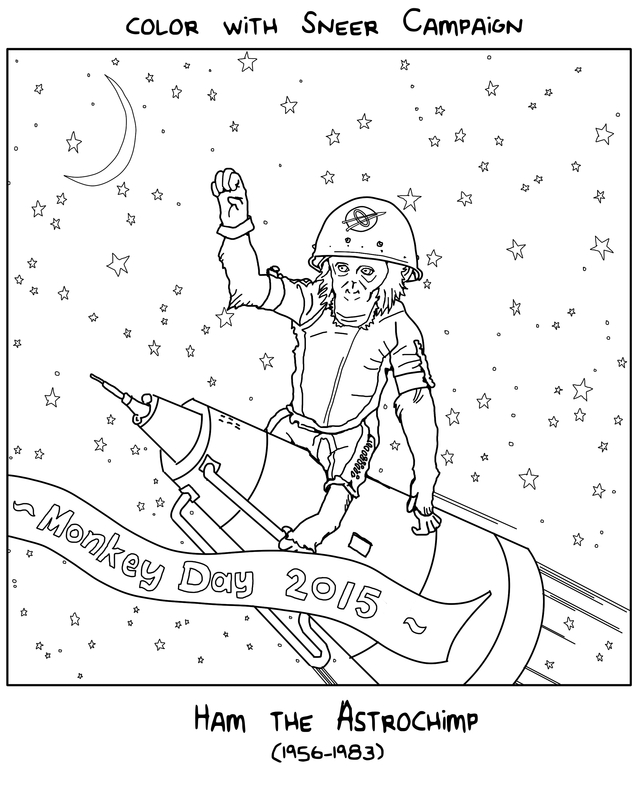 That’s right, today is the annual celebration of all things monkey (and other simians). We learned of this observance this year and we’re proud to help bring some awareness. In celebration, we are honoring a great primate who once lived. Not only did he live, he went to space! And he even came back, unlike poor Laika. His name was Ham. He was an astrochimp, and the first primate in space. Here are some fun facts about him and a beautiful coloring page (click to enlarge) for you to celebrate with! The famous chimpanzee was born in 1956 in Cameroon. Ham was named after the laboratory where he was trained, Holloman Aerospace Medical Center. However, he was not named until he safely returned to Earth from his suborbital trip. He was officially called No. 65, but his handlers called him Chop Chop Chang. Haha, what? His suborbital flight lasted 16 minutes and 39 seconds. He was trained to pull levers! Adorable. Also, he paved the way for Alan Shepard being the first American (human) in space. After his flight, he was sent to the US National Zoological Park to live a happy little chimpanzee life, although he did live alone for a long time. He met a friendly, younger lady-chimp later in his life, Maggie, although they did not have any baby Hams. By 1980, Ham was very overweight when he moved to North Carolina Zoological Park. He died three years later, kind of like Elvis, slumped over in an embarrassing way. He was 25 years young. Ham was originally going to be taxidermied and displayed at the National Air and Space Museum after his death in 1983, but public outcry resulted in him being cremated. Except for his skeleton.